Please fill in the short form below with your question, either about the Simrad ES70 Single Beam , or for some technical advice. Please include details of your vessel if you feel they will help us answer your query. 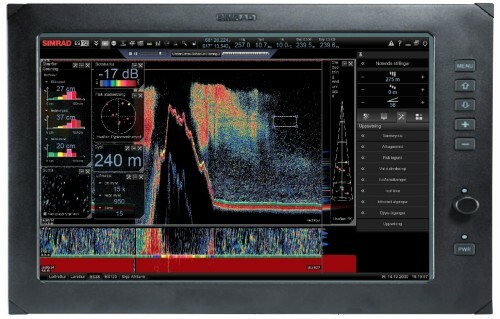 The Simrad ES70 is a next generation Echosounder, for any type of fishery using the latest innovations in computer technology to satisfy the needs of you the customer - Top performance at any depth, and easy to operate! The Simrad ES70 is operated by means a standard computer trackball and a menu system. The display presentation provided is based on an award winning design. The menu system, presentation of echograms, and the user interface elements have been created in close cooperation with designers and users. There are no dialogs. Up to six frequencies on the screen simultaneously. Own display areas for Bottom Expansion, Pelagic Expansion or Trawl Area. On screen readout of Latitude, Longitude, Heading Speed and Temperature. Interface to GPS, Simrad catch monitoring systems and sonars. Screen speed adjusted for Ping rate, Distance or Time. The menu can be position on the right or left side of the display, or removed altogether if you do not need it. Several menu languages are available. On the menus, Simrad's 'smart buttons' are used extensively. These reduce the need for dialog boxes, and allow you to define parameters with only a few clicks. The Title Bar is located on the top of the display presentation, and it is stretched from the far left to the far right side. It allows you quick and easy access to key operations, such as information panes, navigational information and various function buttons. 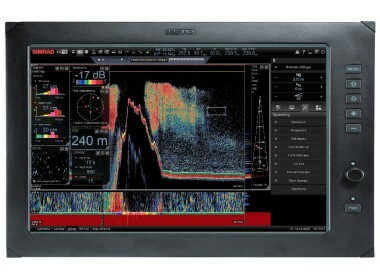 With the ES70 Simrad have introduced a new way to present optional information - the Information panes. With a click on the requested icon on the top bar, the information you with to add to the echogram is presented in a dedicated frame. You can place the frame wherever you want, and you can resize it to any shape. It is even transparent, so you will not loose any information from the echogram behind it. The Zoom function, when used in connection with the optional biomass module, provided by the ES70 is innovative, efficient and easy to use. Using the trackball you can establish an area on the echogram. The information displayed in the Zoom Pane, and the fish biomass is calculated and displayed. The zoomed area can be used to investigate a school of pelagic fish or an areas close to bottom. The new Bottom Hardness pane allows you to investigate the bottom conditions. The ES70 measures the reflectivity, and calculated the hardness on a scale from 1 to 100. The information may also be exported to compatible navigation plotters. 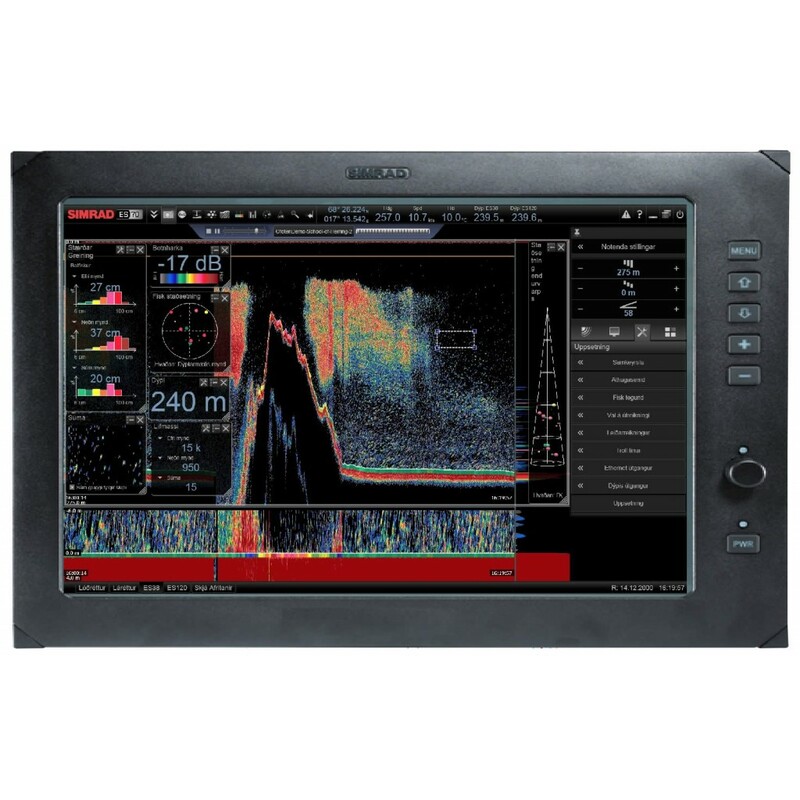 The Simrad ES70 Echosounder is more than a regular echosounder. It has capabilities beyond any competitor. You can put together a system with as many transducers and frequencies as you like, and build the sounding system you always dreamed of: Looking down,or sideways, fish volume, single fish detection in shallow as well as deep water, bottom discrimination, history echogram, recording facility, unlimited personal settings, data output to plotter, etc.